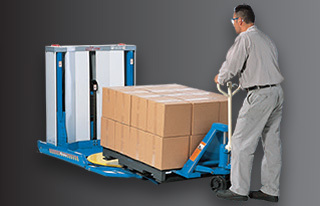 Ideal for warehouses and distribution centers. 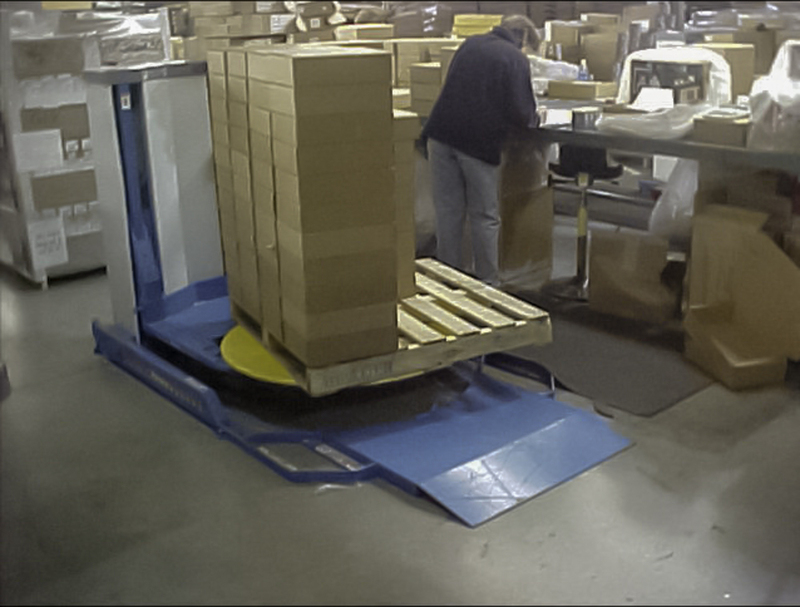 Application: A manufacturing operation processes small parts and ships on pallets. The loads were said to range from 800 hundred to over one-thousand pounds. 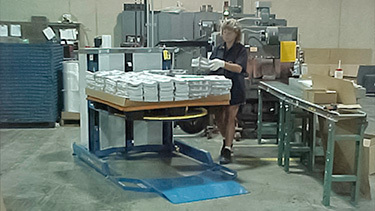 The loads are built as product is manufactured and placed on pallets. 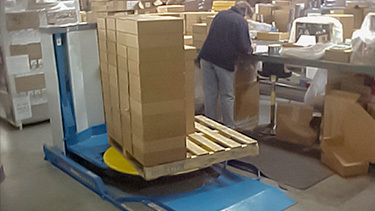 The loads are then transported by pallet jack to the shipping area. Problem: The work cell has limited space requirements and loads must be moved with a pallet jack as fork lifts cannot access this area. Pit mounted lifts were ruled out as these work cells are subject to layout changes for various products. Solution: The desired result is to improve productivity by eliminating bending, reaching and stretching to place product on the pallet. Due to the limited space in the work cell, the client also wants to eliminate reaching across or walking around the load to place product on the pallet and thereby improve the time and effort it takes to build each pallet. The client's desired result is a safer and more efficient working environment. 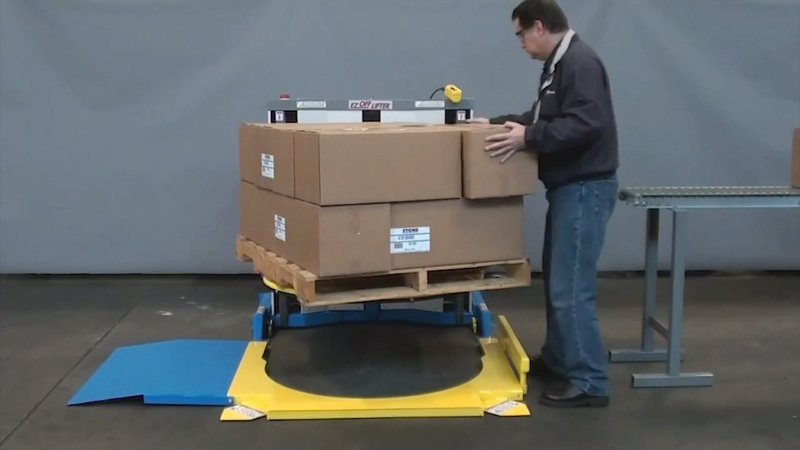 The EZ OFF Lifter ergonomic pallet lift table gives you a tapered, flush to the floor ramp to allow for pallet jacks to easily access the skids. This pallet truck lifting equipment's turntable (standard with the EZ OFF Lifter) eliminates bending and stretching by bringing the parts closer to the operator. 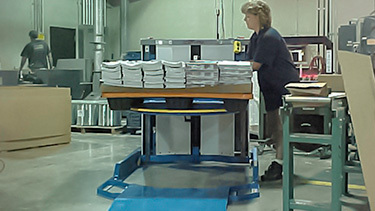 EZ OFF Lifter series Bishamon lift table made the difference in this operation and was the ideal tool to meet all the desired results for improved productivity, efficiency and ergonomics. Contact Ergonomic Partners for assistance with your ergonomic applications. We solve problems! 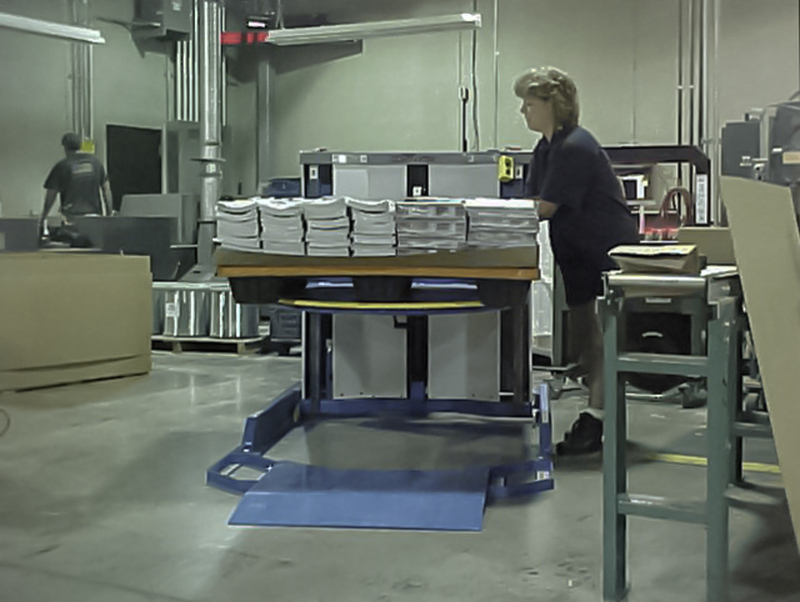 Ergonomic Partners offers pallet lift tables and other services; serving clients from coast to coast, Canada, Mexico and especially focused in the states of Missouri, Illinois, Indiana, Kansas, Arkansas, Mississippi, Nebraska, Tennessee, Kentucky, Iowa, and Oklahoma.